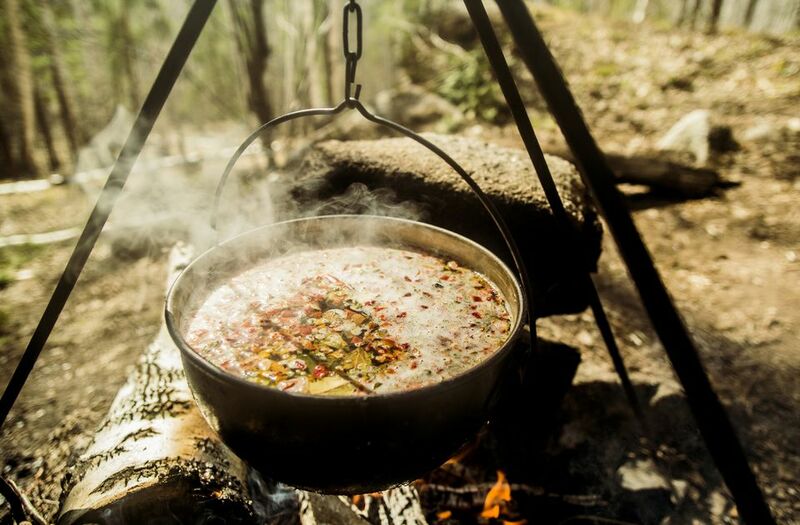 Dutch oven cooking and baking at the campground isn't as simple as it may seem but with the right tools and accessories, your camping meals should be easy to prepare and most likely will taste better outdoors and under the stars. These 15 essential items for Dutch oven baking are recommended by the Mad Chef of the Forest, a Dutch oven chef with more than 40 years campground cooking experience. All you need for Dutch oven cooking is a small shovel, but a shovel with a longer handle is easy on the back. A U.S. Forest Service ladies firefighter shovel is recommended. The lid lifter, or "gonch hook" in cowboy vernacular, enables you to remove the Dutch oven's lid while it is full of coals without dumping any of the coals into the food below. This tool has small legs to stabilize the lid from tipping side to side and is sold in specialty cowboy or saddle shops. Tongs are an all-around item for camp cooking. Tongs are essential for turning meats and vegetables on the grill, and for grabbing anything that is hot. A clean rack is essential for placing the dutch oven lid on, in order to keep it clean. Cabella's and other camping supply stores sell this item. Baking pans keep your Dutch oven clean. Deep baking pans that are 3-inches deep and round are the best to for Dutch oven baking so you get the optimum volume out of your oven. Use beach pebbles or a rack so that you can center the baking pan in the oven to facilitate even heating, just like in a conventional oven. If you choose to use beach pebbles make sure you have four ¾-inch dried pebbles. And if you choose to use a rack, select an 8-inch diameter metal rack. Keep one pair of leather gloves clean for handling hot food items like baked potatoes and for other food handling like husking barbecued corn. The second pair for is for dirty, sooty jobs like handling the exterior of the Dutch oven and other Dutch oven tools. Oven mitts are great for many campground-cooking needs but are also essential for the bail of the dutch oven and for removing baking pans from the oven. The flexible putty knife is used for scraping the bottom of the oven without scratching the iron. A putty knife that is 3-inches wide is recommended. Food should not stick badly if the oven is well seasoned, but if you need to scrape the oven clean, use the putty knife. Do not use a stiff wire brush because it will scratch your dutch oven. Paper towels are nice to have around camp for many reasons and they can be easily disposed of in the campfire. One way to clean a Dutch oven is to heat it on the fire until the food starts blistering and lifting up from the iron. At that time, scrape the oven with a putty knife, dump out the burnt food, and wipe with an oiled paper towel. A vegetable brush is also an essential tool for cleaning your oven. Most of the time an oven can be cleaned by boiling water in the oven and then scrub it with the vegetable brush. Dump out the water using an oven mitt on the bail and the dirty leather glove on one of the legs of the oven and tip the oven to pour the water out. Any time the oven becomes dry (usually after cleaning) and while it is hot, give it a shot of vegetable spray and wipe with a paper towel to keep its Teflon-like appearance. The vegetable spray will keep your oven well seasoned. You will be glad you remembered serving utensils when you are dutch oven cooking. Make sure to pack a large serving spoon, a metal spatula, and a rubber spatula. Make sure to have plenty of firewood. Some Dutch oven chefs like to bring coals so they can be precise when counting each individual coal for specific recipes. Bob Sollima, "The Mad Chef of the Forrest" has been dutch oven baking for almost 40 years, 26 years of which he spent living in the backcountry. Sollima has camped extensively the past two summers and has cooked dutch oven goodies for various celebrities in the backcountry. "You really have to camp for a spell to appreciate the wonders of the Dutch oven. Anything you can bake in your conventional oven at home, you can bake in a dutch oven, and most of the time it tastes better in the Dutch oven. Maybe it's the great outdoors or more likely, the sealed-in blended flavors one gets from the Dutch oven by the campfire."